I just cruised around and finally had a look at Flickr and after searching for "Earthdawn" I discovered some pictures uploaded by "Mataxes" aka Josh Harrison. The pictures are from the "2005 Origins International Games Expo" in Columbus. You see that I linked the guy's on the pictures to their interviews at earthdawn.com. At Flickr you can find further pics of the convention uploaded by Mataxes. At earthdawn.com exists also a "transcript of the "2005 Origin International Games Convention" of several Red Bick crew members talking about the future of Earthdawn. I wonder why Red Brick didn't upload other pictures of other conventions like the Spiel '07 or Spiel '08. Ok, DORP-TV made some video interviews, thanks for those, but I never saw any pictures of other events. Maybe someone else who was at the Spiel '07 '08 or at another convention has some pics or has discovered some, just tell me please. So far enjoy the other pics of the convention back in 2005. The small D6 is a gimmick of Q-workshop. One dice set costs as I previously mentioned 14,90€ (excluding shipping costs of 3,90€). For all of you that are still thinking about to order the dice, don't do it via Q-workshops homepage. I was a little bit disappointed when I had a look at Ebay where the dice are sold for 7,50€. So you better order them there. It looks like that it is the same seller as at the official homepage of Q-workshop. So for all buyers order via Ebay and don't let you trick by buying via the homepage of Q-workshop! UPDATE: I just received a statement from Q-Workshop and it clarifies the whole situation with the Ebay auction. "Q-workshop would like to state, that the mentioned auction was a part of a promotion with lower prices on these new products and available only for a short period of time - and were by no means in any way meant to "trick" any one, especially our clients. Another auctions like this you can find on eBay.com with Earthdawn dice for only 9.99$ (three more left) and 14.99$ (10 hours more so be quick!)." 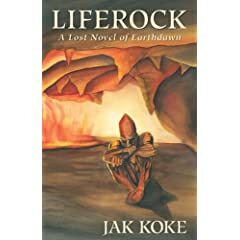 "Set in the post-apocalyptic fantasy world of the popular role-playing game Earthdawn, "Liferock" delves into the fascinating culture of the obsidimen race. Quiet and strong, patient and brave, obsidimen have a deep kinship with each other and the earth from whence they are born. A suspenseful adventure story with rich and entertaining characters, "Liferock" illustrates the difficulties of addiction and the worth of maintaining a connection to the natural world." "They are birthed from the rock fully-grown, live for a thousand years, and then return to the rock once more. Reclusive and peaceful, the androgynous obsidimen of the Garen Brotherhood live and dream atop their high jungle mesa in symbiotic harmony with the earth. But far away, from a cave on the edge of a volcanic sea, something is calling them. Something twisted and strange, a blood magic born of desperation and warped by greed, is gathering obsidimen to itself. Those who answer fall prey to a seductive addiction from which there is no escape. For the youngest obsidiman of the Garen Brotherhood, approaching the source of the call means risking a millennium of slavery to that twisted power. But go he must, because the blood magic has ensnared his tribe's lost Elder, their last hope of protecting their liferock from the forces which would destroy it." Well, fine......would you now want to buy or read the book? No? Or do you already own it ? No? I got an offer for you! You can read 80 pages for free and then decide if you gonna buy it via Per Aspera Press, amazon or wherever. Agreed? Well then. Via google booksearch the first 80 pages can be read as a free preview.